Paradise Ranch Cottage ‘Bring Your Horses’ Trails abound on this 200 acre ranch, enjoy a one bedroom cozy cottage with your horses paddock a few feet away, Fire Pit for your evenings, Swimming Pool after a good ride, training in the round pen or out door arena, Tack Room, and hours of trails right here on the ranch or jump on the rails to trails and explore 52 km of horse quality tracks along the Slocan River. DONT RIDE?? don’t worry, Bring your best out door gear…you can hike , bike, swim , drift down the Slocan river in inner tube, kayak, climb, fish , golf, shop skip, sled, hunt, and go for scenic drives . And more. 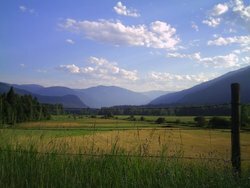 The Slocan Valley is a HUB of out door experiences. When you have spent the day doing what you love to do? 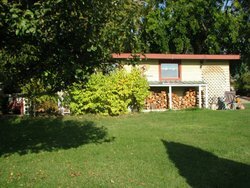 Relax in front of your own fire pit or suntan around the ranch swimming pool. Its all here for you to enjoy.